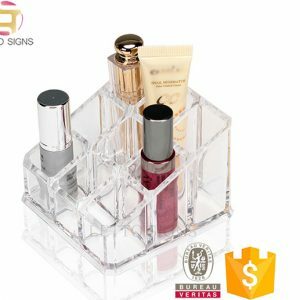 3.Easy to be assembled and disassembled according to the User Manual, DIY the makeup organizer and adjust the height as you like. 4.This Skin Care Storage Holder is sturdy enough with durable trays. Fabulous gift for family and girlfriends. 5.As cosmetic displays are predominantly made out of acrylic, choosing the right grade of acrylic is essential. For displays where the cosmetic product is being tested we’ll make sure the plastic used is hard-wearing and won’t be negatively affected by the product.